Wearable tech is looking for fashion icons in 2015 and the candidates keep coming. Liber8's Tago Arc smart bracelet puts fashion first with its slim, curved E Ink display which can be customised to preset patterns or images from your smartphone library, much like the LookSee bracelet we saw at CES. Tago has just launched its crowdfunding campaign on Indiegogo and has already smashed its modest $40,000 target. You have until 13 March to pledge, $250 or more gets you a gold, silver or black bracelet. The idea behind the device is to make the Tago Arc fuss free - no buttons, no cables and - most interestingly - no charging. Liber8 claims that its NFC bangle is so low power thanks to the passive E Ink display that it doesn't require a power source. Instead Tago says NFC induces enough energy during the image transfer, which currently takes up to 15 seconds, that the E Ink display is able to reconstruct the image. That means during transfer, the bracelet draws power from your smartphone, when simply displaying the image it doesn't need power. There's no battery - genius. Rival LookSee quoted one year on a single charge for its smart bracelet but doesn't use this innovative NFC charging method, it simply relies on the low power E Ink display. The Arc is Android only at launch with a 'coming soon to Google Play' note on the website and Samsung smartphone in the images. Tago notes on Indiegogo that the iPhone's NFC is only enabled for Apple Pay. That's another difference to the LookSee which is an iPhone compatible Bluetooth wearable and can also display notifications and QR codes. On the Tago Arc there will be free and paid for black and white images to choose from via the companion Tago app and users are encouraged to create and upload their own designs. The company is shunning Bluetooth pairing for NFC at the moment as it reckons this is one of the barriers to people using wearable tech. That said its R&D plans include devices such as the Tago Arc Pay for mobile payments in the future as well as various badges, passes and smartphone cases. 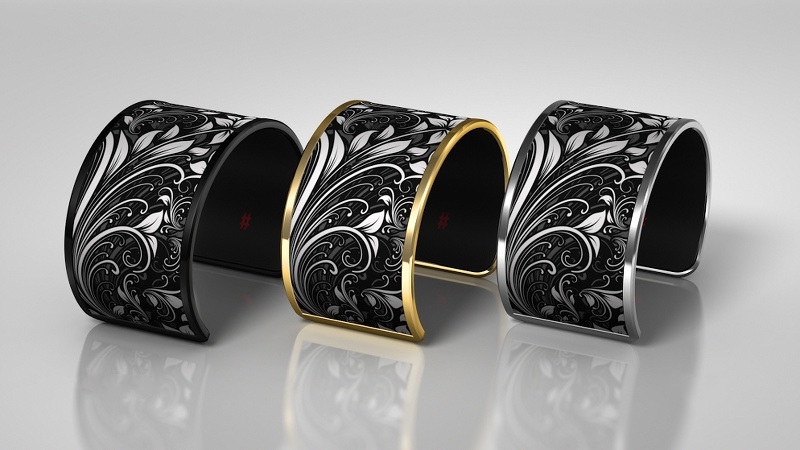 Liber8 Technology says it will be ready to mass produce the bracelet by the end of 2015 and Indiegogo backers will get their Tago Arc bracelet by December.